Doesn’t this look beautiful? It tastes delicious too. 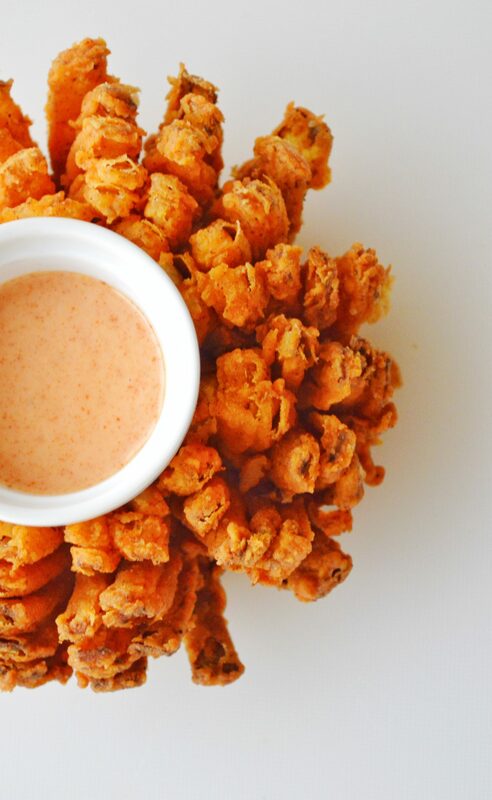 This is blooming onion, which is a dish with one onion cut to resemble a flower, battered and deep fried. 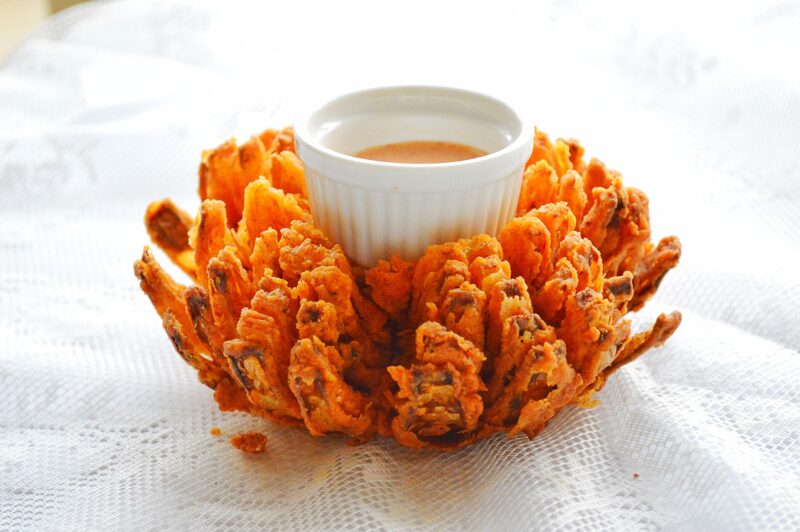 It is surely a very impressive looking appetizer which will be loved and appreciated by all. 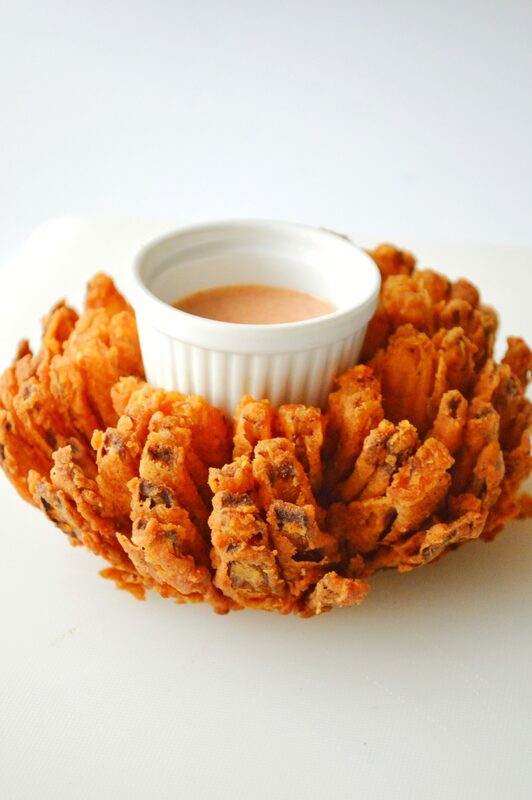 Blooming onion is actually a very famous appetizer served at this restaurant named Outback Steakhouse. I never tried it though, but my brother has and he says that he loves it to the addiction level. That restaurant is not there in Kuwait but its there in Dubai, where my family lives. The next time I go there i will definitely visit that place. I had made this awesome dish for iftar yesterday and me and fadal loved it. I had made a nice honey mayo dipping sauce to go along with it. It was so good that we were dipping all the other appetizers in that sauce too. 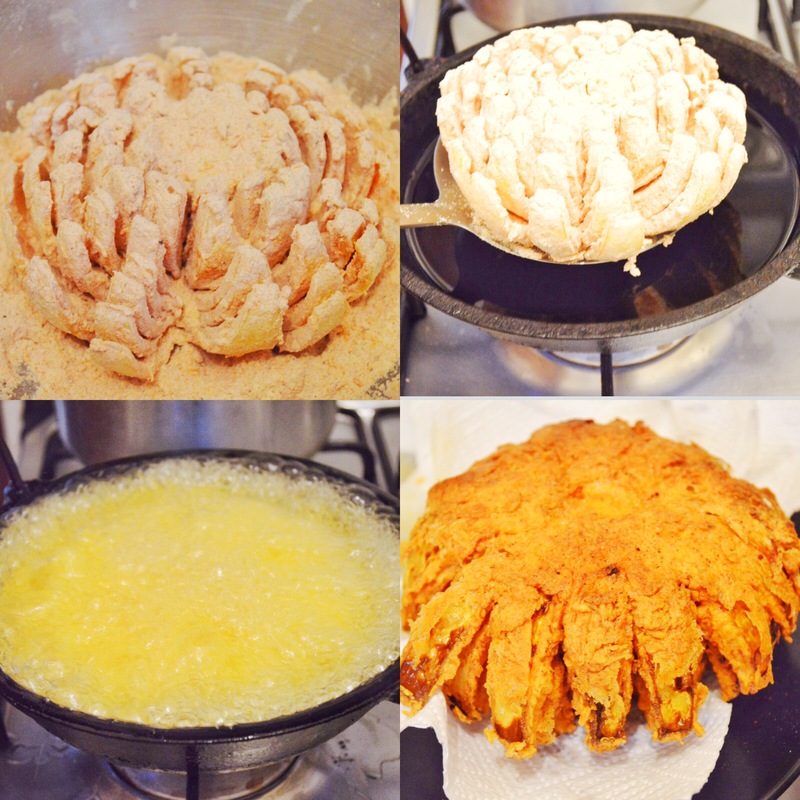 ✔️ If you dont want to fry the whole onion, you can make onion rings with the same recipe. ✔️ Be very careful when dropping the onion into the oil. 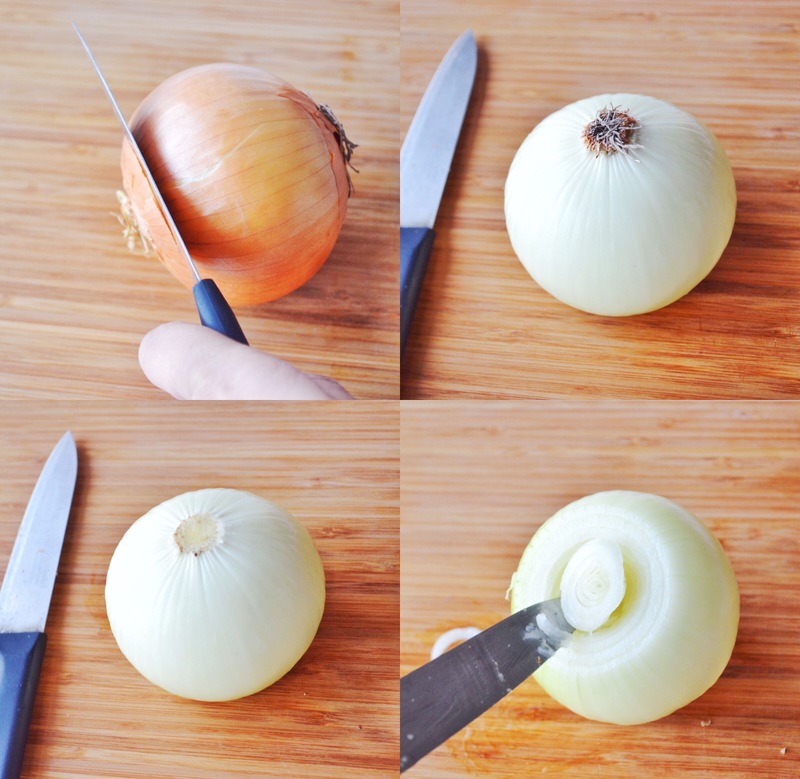 Place the onion on a round spoon and carefully drop it into the oil slowly. The oil might spill out if you use a small pan. 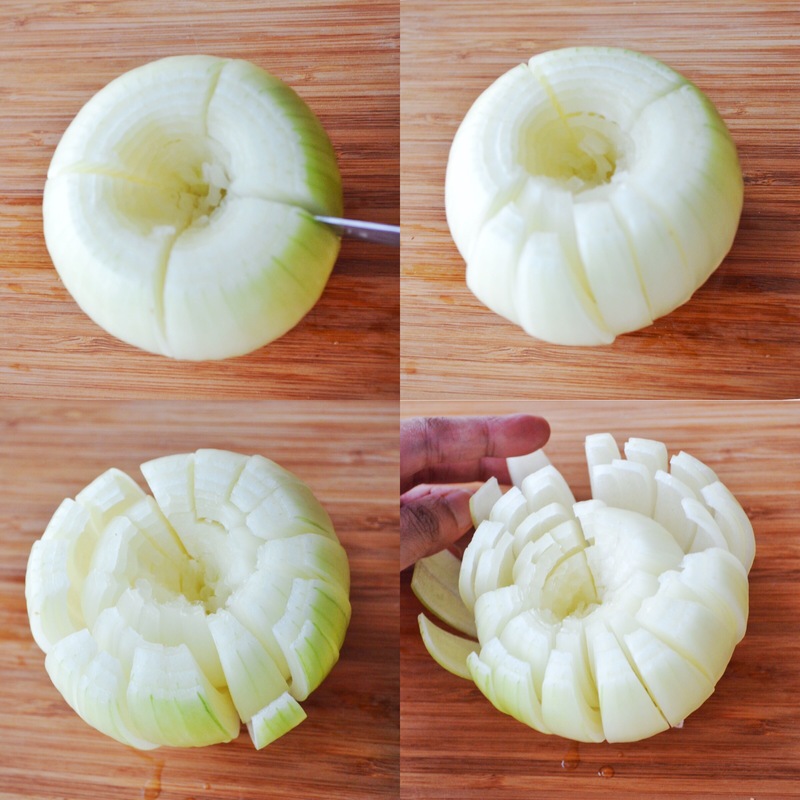 Slice one inch off the top of the onion. Then slice the roots keeping the stem intact because thats where the onion petals will stay joined. 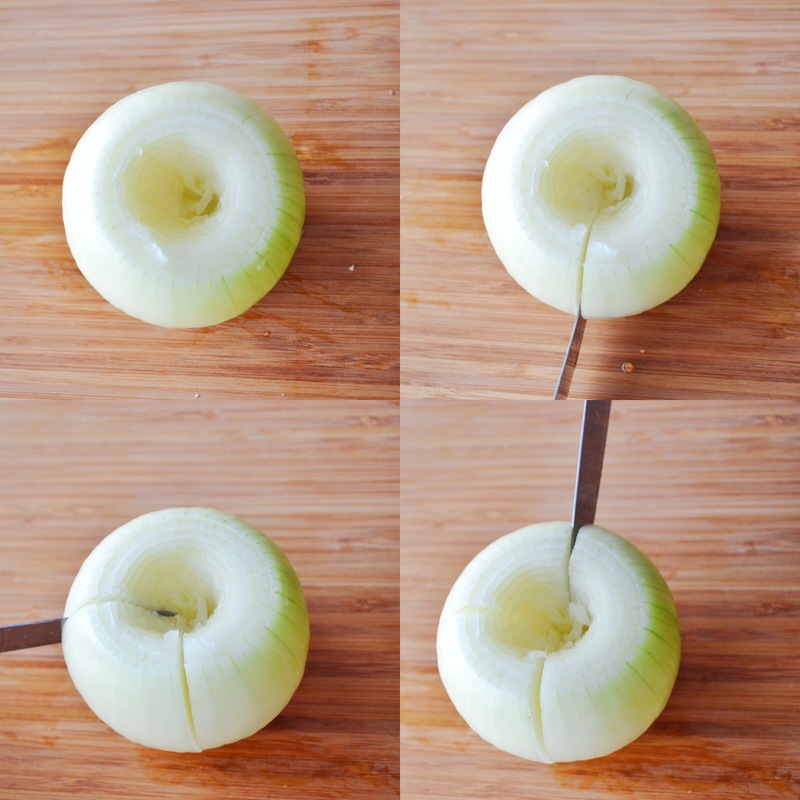 Using a thin knife cut out a 1 inch diameter core from the center of the onion. Using a sharp knife make four evenly spaced cuts. Make sure you keep an inch space from the root. In between each of these four cuts make another three cuts. Separate the petals with your fingers. 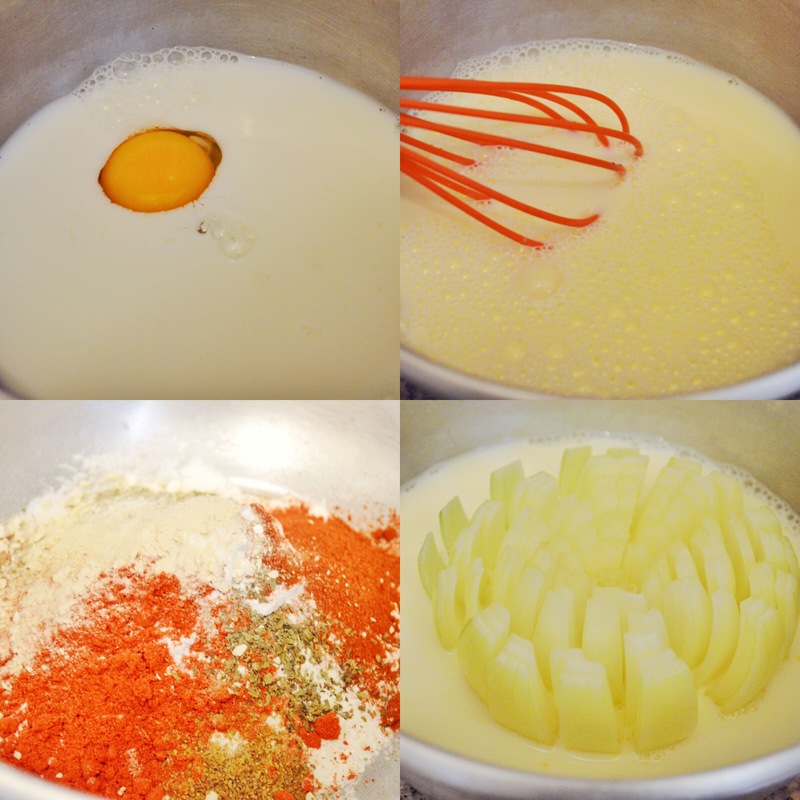 In a bowl whisk together the milk and egg. 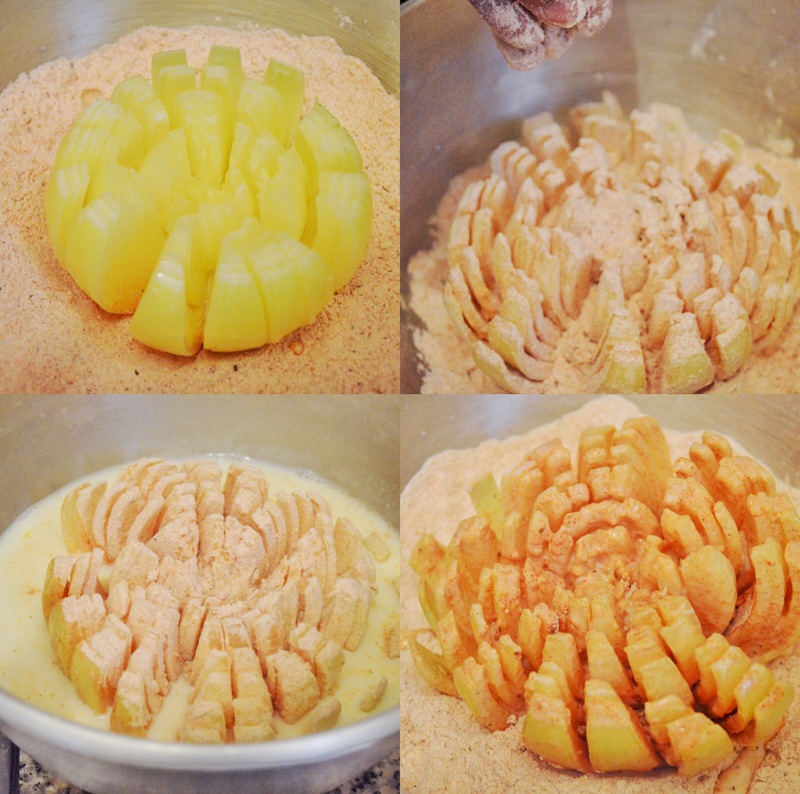 In another bowl, combine all the ingredients listed under flour mixture. Take the onion and dip in the milk mixture. Place it in the flour mixture making sure to spread the flour all over the onions. 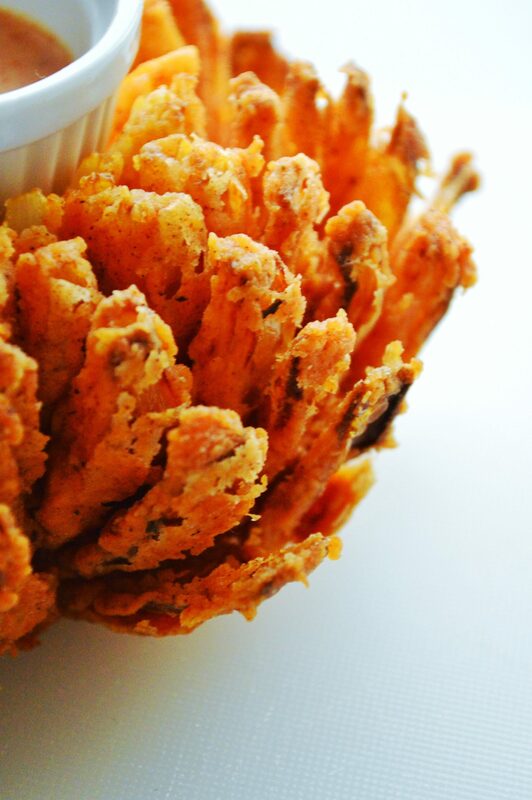 Separate the petals with hand and sprinkle flour in between the petals. Double dip the onion back in the milk. Again place in the flour mix and spread the flour all over. Shake off excess flour. Keep in freezer for half an hour. Heat oil in a deep heavy bottom pan in a medium high flame. There should be enough oil to cover the onion. Drop the onion cut side down into the hot oil and fry for 2 minutes. Then very carefully flip it over and fry for additional 8-9 minutes on medium heat till it turns golden brown and crispy. Take out of the oil and drain cut side down ona paper towel. Mix in all the ingredients listed under dipping sauce. 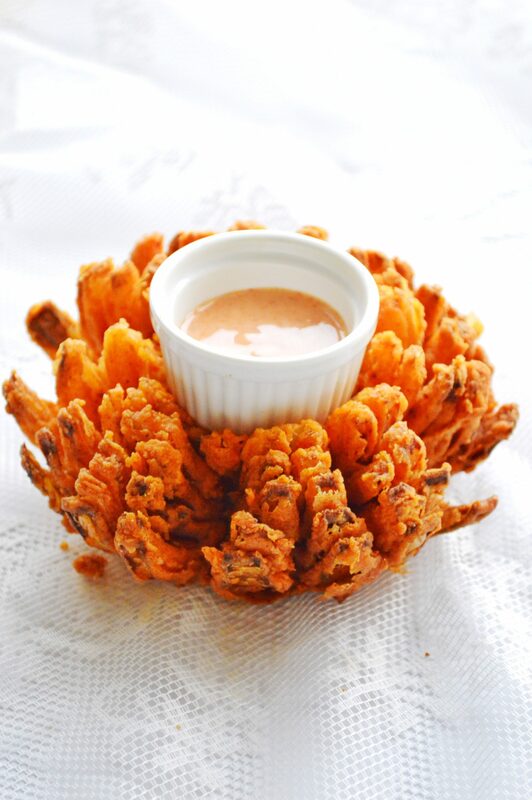 A dish with one onion cut to resemble a flower, battered and deep fried. * If you dont want to fry the whole onion, you can make onion rings with the same recipe. * Be very careful when dropping the onion into the oil. 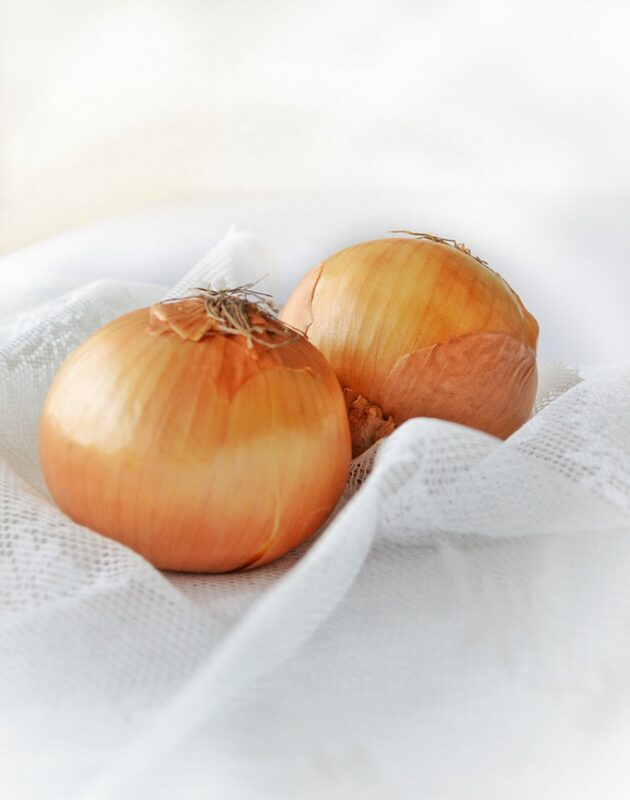 Place the onion on a round spoon and carefully drop it into the oil slowly. The oil might spill out if you use a small pan. 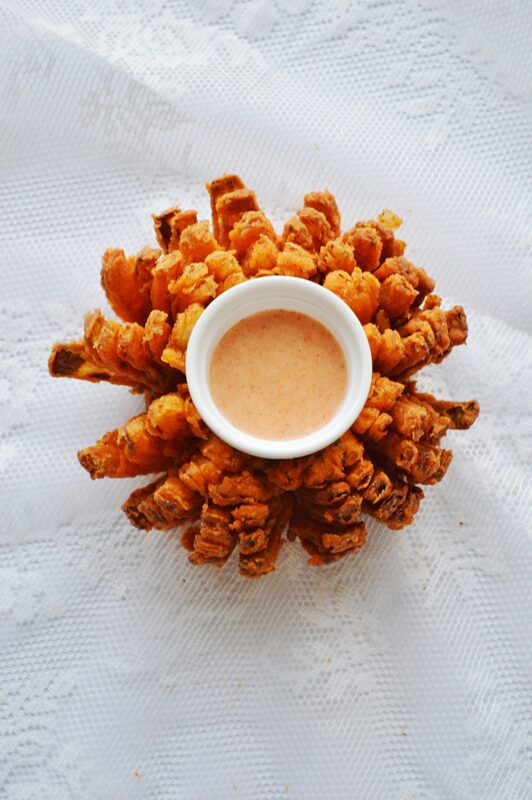 My husband regularly asks me to go to Outback Steakhouse so we can eat this. Until now, I was appalled. Now, I am intrigued! You should try this dear. Im sure you will like it. 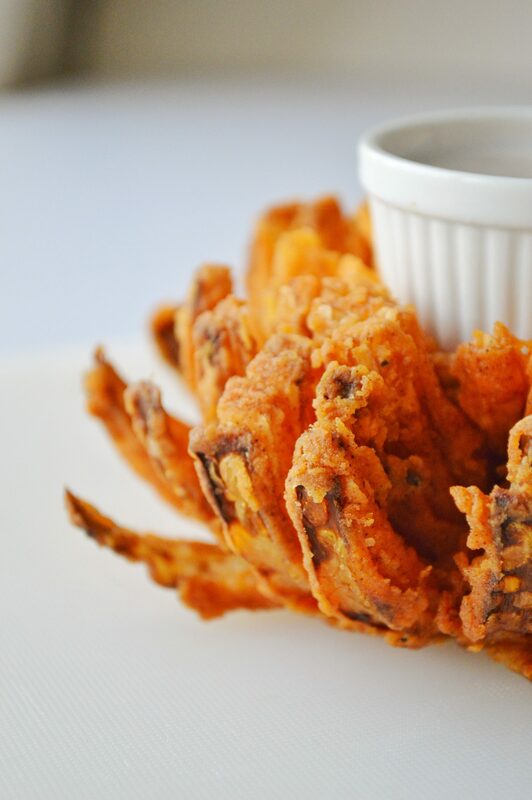 That onion is really pretty, I have seen them in restaurants but never thought of making it myself. Pretty easy too! Yeah it really is easy. Can i make it without egg? Followed the instructions perfectly, but could not get the petals separated well and the batter all fell off! Oh no, that’s bad. Did you cut till the tip?